Hot Dogs and Frankfurters During Pregnancy - Are They Safe? Q: I heard hot dogs are not good for overall health. Is it safe to consume hot dogs during pregnancy? A:Hot dogs or Frankfurters are a moist sausage that are made of meat slurry or meat. They may be fully cooked, cured or smoked. The hot dog is usually served by placing it between hot, sliced hot dog buns. The hot dogs are can be spicy or mild and may be made from chicken, pork, beef and turkey. Often garnished with ketchup, mustard, mayonnaise, onion, cheese or chili, they are a delight for your taste buds. Even if you feel a craving for hot dogs during pregnancy it is better to avoid them, especially if they are not completely heated above 160 degrees Fahrenheit. Although it is said that they can be eaten by expectant mothers when heated to 160-170 degree Fahrenheit for two minutes, you may want to avoid hot dogs during pregnancy as they may still carry the Listeria bacteria. These bacteria cause a disease called Listeriosis which can cause negative effects in the unborn baby which can lead to miscarriage or still birth. The hot dogs purchased from street vendors are especially dangerous and can be contaminated because the water they are heated in is well below 160 degrees Fahrenheit. Also, the cheese that they are garnished with can harm the pregnant mother and the fetus if it is not pasteurized- bleu cheese, Brie, Camembert, Roquefort, Feta, Gorgonzola and Mexican style cheeses that include queso blanco and queso fresco for instance are often not pasteurized and thus are unsafe for pregnant mothers. 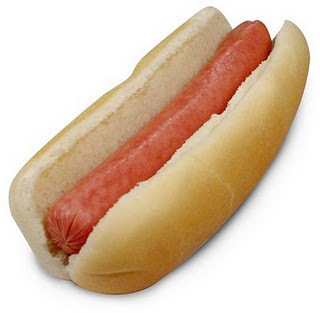 Packaged hot dogs are usually rich in preservative nitrates and nitrites that can be harmful. There are local health food stores that sell nitrite free chicken and turkey hot dogs. They seem to be the safer bet but the possibility of contamination cannot be ruled out. Hot dogs are also high in fat and salt that are not good for your body or your baby. Hot dogs are best avoided during pregnancy when your immune system is weak and you and your baby become vulnerable to food borne illnesses.